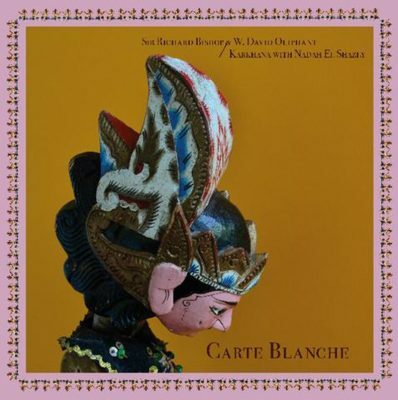 Carte Blanche, the latest in Unrock’s Saraswati series, showcases how globalized experimental music has become. The first side features two American musicians—one who expatriated to Cairo—collaborating on tracks with titles referencing Hindu mythology. The second, a cosmopolitan, based improv group working with an Egyptian songwriter on tracks with titles that read Middle Eastern-like excerpts from French surrealist poetry. Far from gleefully tearing through the fabric of cultural identity, the two sides—by Sir Richard Bishop with W. David Oliphant and Karkhana with Nadah El Shazly, respectively—highlight the tensions and subsequently limitless possibilities available when deconstructing strict borders of national idioms. For their side, Bishop and Oliphant deliver murky, literally stormy music that develops through structurally loose progressions. Immediately, texture takes precedence over motives or harmony as twangy acoustic guitar coincides with metallic vibrations and canned rain noises on opener “Rakshasa.” After over five minutes of an eerie calm, a crushing noise burst and fading sirens disrupt the stasis and help introduce the repetitive guitar arpeggios that define the track’s second half. “Axiulou” has a bit more motion, utilizing percussion and warped violins in a constantly shifting call-and-response as a backdrop for guitar improvisations. Given the immediate textural appeal of the music and its slow-moving flow, this first side feels particularly filmic. Not that the sounds need visual aid to speak, but rather that their overwhelming darkness reads as similar to 1950s Akira Kurosawa drama, where the defining emotions are suspense and despair. Each figure, especially in “Axiulou,” is like a narrative character, taking on slight changes when its counterparts demand space and reaction. There’s serious attention payed to small moments of connection and contrast, even if the apparent feeling is that of impenetrable totality. The second side is less bleak than the first, focusing more on group interplay than wall-of-sound drones. Right from the opening notes of “Enlevez Les Trottoirs, Je N’ai Plus Nulle Part Où Me Rendre,” the music possesses more clarity and direction. Karkhana and El Shazly alternate between pulsing rhythms and slouching free-form sections, subtly moving between these two poles through buildups and breakdowns. While the side’s final track, “Prends-Moi En Photo Pendant Que Je Pleure,” veers closer to the freely improvised sparsity of Bishop and Oliphant’s side, the effect is more playful. It’s a flowing mess of loud guitar and beeping synthesizers, near nine minutes of colorful timbres placed together in novel combinations. While the album in general is an exercise in East-meets-West tension, Karkhana and Shazly take extra joy in toying with expectations. Quarter tone grace notes and reedy drones are placed directly against clear, just intonation triads on guitars and steady rock drumming. Sometimes, like the final minute of “Enlevez,” the combination is jarring in its unapologetic collision of traditions. Where the first side tried to bury these stitches under the universality of noise, here the seven musicians use open space and careful placement to highlight the inherent oddity of culturally laissez-faire music.